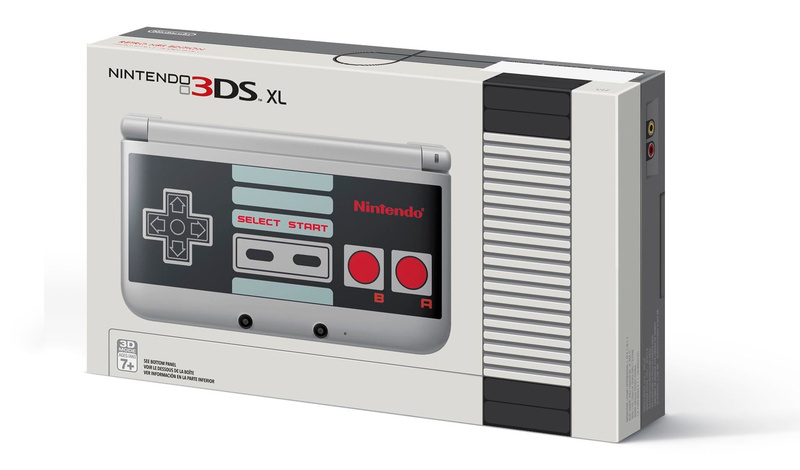 Nintendo certainly grabbed attention when it announced a NES-themed 3DS XL; the model will be exclusive to GameStop in North America, and unfortunately there are no plans to bring it to Europe. It's due for release on 10th October and will cost $199.99. Not all love the design, however, with the presence of the NES controller graphic on the outer shell surprising some, particularly those that prefer the Game Boy Advance SP NES design. This 3DS design has certainly split fans, failing to gain universal praise to have North American gamers rushing to stores; especially with the 'New' 3DS models due in the West next year. Reddit user Kungfuquickness has produced his own NES 3DS and posted instructions for gamers to follow if they want to follow suit. It involves sanding, plenty of paint and a decal purchase. Both systems, for comparison, are below. Which do you prefer? Nintendo's shiny retail version, or the homely efforts of a 3DS fan that decided to produce an NES XL their own way? Let us know in the comments below. Why is it that the fans can always come up with better stuff than the official company. I love it because of its simplicity yet glaring obviousness of what it's referencing. I don't like the fan made one. I actually like Nintendo's better. I prefer Nintendo's design over the fan-made one. The homemade one is loads better. Nintendo really phoned it in with its own efforts. The GBA SP from a few years ago was so much nicer than this lame offering of theirs. I prefer the fan version, I like my hardware to be designed simply and discreetly. Not over the top enough to make strangers stare, but for like-minded fans to figure out what it is and appreciate it. The official one just looks cluttered and unnecessary to me. Same goes for the Smash Bros. XL. I would much rather it just had a Samsh Ball rather than the entire cast and logo, I probably would had bought it then. I can just buy a NES controller sticker for 99 cents. I prefer the fan version if only for its minimal design. The official Nintendo one is more eye-catching, but the purist in me likes how the fan made one is more true to the console's design. Why would the control pad be on the outside of the console? Come on, Nintendo. I prefer the official one. Neither of them are good imo. I vote NES GBA SP or Famicom GB Micro. Err... I prefer Nintendo's. Yeah, it looks like a sticker but we all know its printed on the system. We need one that combines both! Top of the NES on the outside, NES controller on the inside. Obviously there would have to be some changes due to button layout, but get the colors right and design inspired as such, and it would be awesome! I think the cart door drawn around the cameras would sell the fan made one more. Nintendo's design is lazy. I love the fan made one! I prefer Nintendo's design, the other looks dull. But, why is Nintendo releasing so many custom designs for the old 3DS, when they could just save them for the New 3DS model( since you can customise it)? Do they want the New model to fail or something? I prefer the official slightly, though I gotta say the fanmade one makes clever use of the silver XL. Much better than Nintendo's hideous version. The real win of the official one is the inside of the console. The outside is a bit off putting. Like someone else said earlier the outside of the fan made with the inside of the official would have been perfect. Still would rather have an snes themed one though. Half the reason I'm leaning towards the smaller New 3ds vs the xl is for the super famicom themed buttons ha! To quote the Bard, "An XL by any other name would be as crap." This is exactly what I was describing. They blew it with that controller design. ...Is it wrong that I prefer Nintendo's design? Eh...one problem with Nintendo's is that, when it's open, and therefore visible to onlookers, the controller design is upside down. Well...either way, it would have to be upside down in some case, whether closed or open. I prefer the Persona one. Well, obviously, the fan-made one looks less ridiculous. The lack of painted-on buttons on a functionless controller plastered on the back of the screen, inherently makes it superior. @ogo79 I've got an NES wallet just like that!!! Have to say I prefer Nintendo's design more. There is a seriously disturbingly gross picture under the "More stories" section here. Now that's more like it. This is why Nintendo should handle designs! I just desperately want ninty to offer us a forest green New 3ds xl. Sigh. @ogo79 Self burn?...this is why we don't play with lighters! The fan one… doesn't actually look that much like a NES… at all? I'd have preferred the design for the box of the official one as a design. I can't understand why the fan one doesn't do that, to be honest. I think the Nintendo Controller looks better IMO. I think it's a good idea for how the official design should have looked, but that paint job looks too rough for me. What a pile of poo, the original DS looks better. Or identical, for that matter. This actually makes me want that weird Nintendo NES one... yeah, I'm weird. The official one looks a lot better. If the official one came to Europe as a new3DS model i'd be very tempted even by the box alone. This fan-made one misses these dimensions and has nothing special going for it imo. I think if the NES GBASP did not exist then people would be going easier on the NES 3DSXL. Nintendo did something very special with that old Game Boy, the 3DS they made feels lazy. This fan one is closer to what it should be. I would say they are about even to me the fan made one would look better if the cord plug ins were on there as a décor and if a bit more was put in to look like an actual nes while the official Nintendo one would look a bit better if the picture was enlarged to take up the entire top instead of most of it even if it would cut off from some of the side's. They're both not very good, don't have a 3DS yet but I wouldn't pick these up. The Nintendo one's slightly better, I really don't like the strip on top of the fan made one and we don't know what it looks like inside. Eh, what's the inside of this fan made one like? Nintendo probably considered this design too, and when seeing them together it confirms what I never doubted: Nintendo made the right choice out of the two. Of course, if Famicom design was an option, like that lovely GB Micro of gamepad faceplate, it would still win any day. But Famicom is less western, obviously, so far fewer people here have memories of that. Yes, it looks ok but it' still nowhere near good enough. 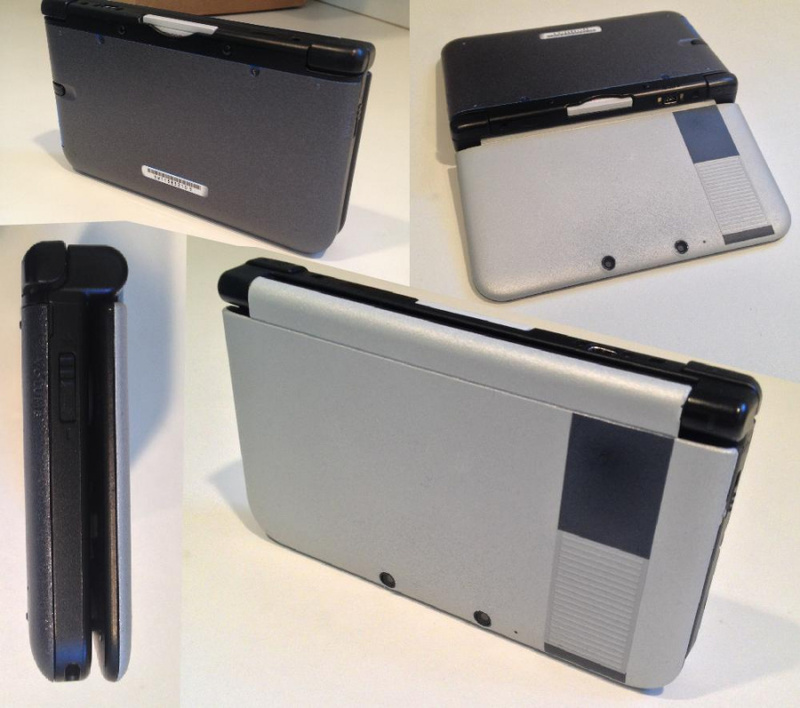 The whole 3DS system needs to have the top coloured in light grey and the bottom in medium grey for a start. Then on the front that strip needs to have equal sized black portions at either end (just like on the box of the official version). Inside the face buttons need to be the same red as the NES controller and have the ABXY printed off the buttons in red. The d-pad needs to be black. both the d-pad and buttons need a little light grey border/area around them, just like on the NES controller (they could make it d-pad shaped around the four buttons for example). The analog stick is fine. There needs to be a dark grey area across most of the inside face of the bottom half too. As well as a couple other little touches. Also, and maybe this is just me, but I'd love to see official 3DS themes that match most of Nintendo's classic consoles: Famicom, NES, SNES (both Japanese/UK and American colour schemes), N64 (mostly just matte black with coloured buttons and stuff. Although, could even do some of the original iMac-like semi-transparent versions too), GC (purple), along with the modern plain black and white options that basically mimic the Wii/Wii U anyway. I think every one of those would sell a crap load of extra systems. As per usual...that's what I'd do if I had any power at Nintendo. How did you do it? Did you paint the shell and buttons, or did you order plastic in that matt wood colour then mould it? @ZenTurtle it was custom built from working in the industry perks you can say.... and no its not a decal it is a case the same as the one you get when you buy the console good ole nintendo plastic. What did you use to put the decals on? is it paint? stickers or something else? i'm interested in getting into console modding, any tips? Are there pics of Nintendo's one opened? The fan design would look great with a little bit of red in it. A red nintendo logo somewhere on it would make it excellent. Nintendo - Box Art for Display and 3DS with retro NES design. I was sold on the official box art, alone. After that, the 3DSXL is just a prize in the box after eating all the cereals! Yay~! I would probably pony up for one if it was styled more similar to the Advanced SP NES edition.